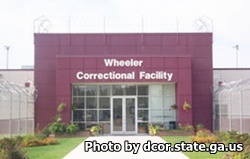 Wheeler Correctional Facility is located in Alamo Georgia. It is a medium security institution that houses approximately 2,874 adult males. The offenders are housed in a dormitory style, with eight units containing 80-88 offenders in each dorm. The segregation unit has single cells for housing inmates in segregation and isolation. Segregation is reserved for inmates who present a challenge to manage, or have safety and security issues. Selected inmates may work on crews that assist various county departments such as parks and recreations, recycling, sanitation, and other agencies. Offenders can take educational courses that include adult basic education, and GED courses. Worship and prayer services are offered by the Chaplains office. Counseling is given in individual and group sessions, and cover a range of issues from substance abuse to family violence. Inmates can also take vocational courses on computing, masonry, carpentry, plumbing and electrical systems. Visitation at this facility is on a rotating schedule, because of this we ask that you contact the institution to get the current rotation times. Please use the telephone number provided to get the visiting hours.